This is a fine CD which I have enormously enjoyed listening to. Allow me a couple of quibbles first, though. 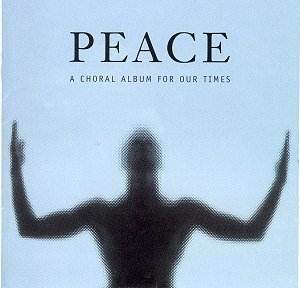 First that title; �Peace: a choral album for our time�. The music contained here ranges over three or four centuries, yet apparently, unlike other choral albums, this one is �for our times�. Why? Seemingly because it contains peaceful music, in a time of conflict. This sounds fine, until you realise that this attitude risks reducing great music to some sort of palliative for the nerves � something you can use to calm yourself down after the stresses of the ten o�clock news bulletin. If music is to play a part (as Grant Llewellyn, in the booklet, suggests it might) in improving the plight of the world, it�s going to be by resolving conflict within ourselves rather than just applying some spiritual TCP. That said, there is some very fine unaccompanied choral singing to be heard here, ranging through history from Victoria�s O magnum mysterium of the 16th century through to Tavener�s Song for Athene of the 1980s, and taking in some of the most challenging a cappella repertoire along the way in the shape of the Barber and Schoenberg items. Like the Accentus Chamber Choir�s CD which I reviewed , this issue arguably features too much slow music. However, there is the plenty of variety in the styles here, and none of those ill-fated Mahler transcriptions which dogged the Accentus issue. The Handel and Haydn Society Chorus is a superbly balanced and blended ensemble, and I much admire the way Grant Llewellyn shapes the music. His tempo for the Barber Agnus Dei (the composer�s own transcription of his Adagio for Strings) is quicker than usual, but this has great advantages; a speed that is practicably slow for strings will stretch human voices and, especially, lungs well beyond what can be fairly expected. So the reward is a performance that flows and unfolds quite naturally, yet is free of sentimentality or forced emotion. Schoenberg�s Friede auf Erden (�Peace on Earth�) is a colossal challenge for any chamber choir. It is a most moving piece, but almost impossibly dense and complex in its textures and harmonies. The choir gives it everything, and the ecstatic emotion comes across powerfully, as does the sumptuous polyphony. There is one moment that sounds suspiciously like a re-take for pitch adjustment purposes (around 7:30), but, though a little clumsy, it is in no danger of defacing a distinguished and highly successful version of this masterpiece. Incidentally, I simply love the sound of this choir�s tenor section; open-throated yet smooth � where do you get choral tenors like that! Those who are not familiar with Randall Thompson�s Alleluia are in for a treat � it�s one of the most hauntingly beautiful short choral works of the 20th century, and performed to perfection here. The same can be said for Górecki�s Totus Tuus and Tavener�s Song for Athene, though I do have to say that I prefer this last sung by all-male voices; that said, the HHSC make a splendid job of it. Sorry about the Elgar Lux aeterna, it�s just horrible and tasteless � the arrangement, that is, NOT the singing, which is excellent. This is a version of Nimrod, which, unlike the Barber, was not made by the composer himself. Though it was no doubt a brilliant piece of opportunism to turn it into a piece of choral music suitable for funerals, memorial services and the like, there is just one problem � the words don�t fit, not slightly, not even remotely! That apart, this CD contains some truly world-class choral singing, and is full of memorable musical experiences. Splendid recording, too, in the sympathetic but not over-lively acoustic of the Church of the Redeemer at Chestnut Hill.